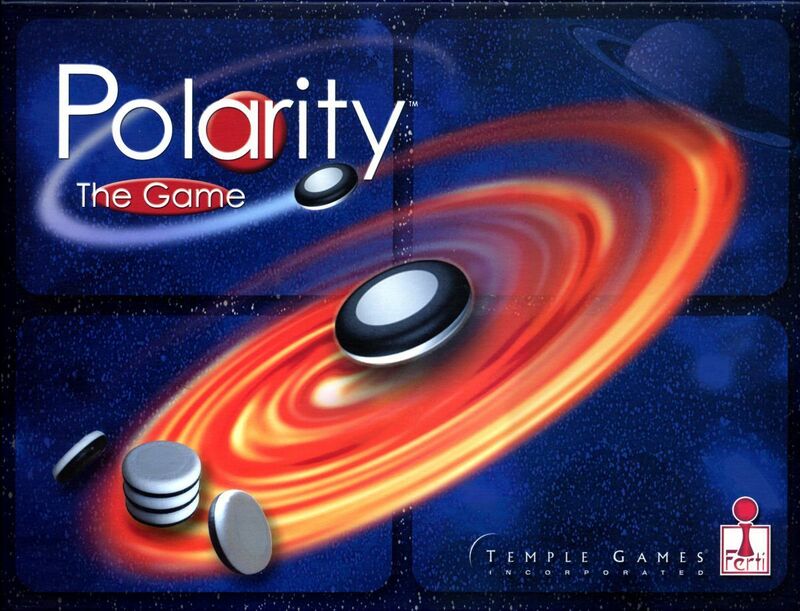 Once rare and mysterious, now thankfully back in print, Polarity is a 2-player game using lots of magnets (so keep it away from credit cards, watches and so on). The plastic coated pieces look like Reversi/Othello discs, with black and white faces. Each piece contains a magnet, with the black side being North and the white side being South. Each player gets a stack, one plays black one plays white. A neutral red piece goes in the center of the game cloth and players start by place five each of their stack around the cloth. These flat pieces are the foundations. On your turn, you take one piece from your stack into your hand, then bring it to bear against one of your foundations. You keep your color face up, so the opposing polarity bears against your foundation piece. This way, you can very carefully balance your new piece in the air against the foundation stone! This is just fantastic to see. The board fills up with lots of discs teetering at 45 degrees, ready to fly about if the balances are upset. Get it right and your stack is one piece smaller. Make a mistake and your turn ends. Either a piece falls flat somewhere (becoming a new foundation) or pieces jump together making towers or into your hand. Your opponent takes the tower you accidentally made and places it their side up where they like. Towers get you points at the game end. If a piece jumps to the stone in your hand, they both go back on your stack. The game ends when one player finishes their stack and points are calculated based upon towers and discs remaining. Causing the red piece to jump to another loses you the game outright. To be honest, the scoring matters less than the tension and joy of watching the natural but weird force of magnetism at play. Because the discs are discs, they can easily roll around, causing domino effects. Because the towers increase the magnetic pull, they make it so much harder to find a safe spot to play. If you want a strange fun game to amaze your friends and family, Polarity is hard to beat. If you want a serious 2-player game, you may prefer other abstracts. The rules could do with being shorter and simpler. Otherwise, a joyous game. Comment from the designer "Polarity began as a sculpture. Polarity is zen. It represents that point where absolute opposites merge. In this case, the poles of the magnetic field. The quality of play is determined by one's ability to perceive balance in the midst of extremes. Each game is unique and can never be reproduced. It is in that uniqueness that I was awarded a patent from the U.S. Pat. & Trdmks. office for magnetic principle. The strategy must be viewed 3-dimensionally. It is not just control of a 2-dimensional board but must include the space above and below the playing surface."